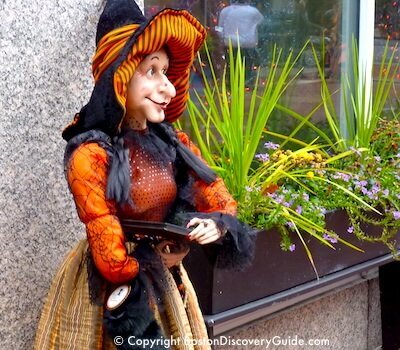 Witches, Ghosts, Vampires, & Parades - Plus More Halloween Events! 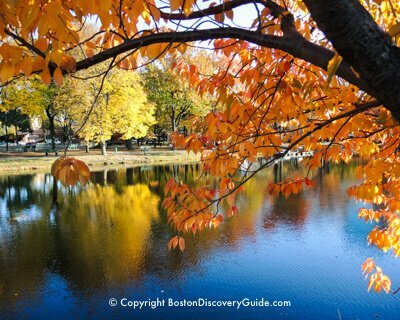 Halloween in Salem Massachusetts is a month-long spree of haunted happenings, séances, ghouls, ghost stories, witches, pirates, vampires, and the macabre. October is the perfect time to visit if you want a glimpse of the city's darker past along with plenty of present-day fun. 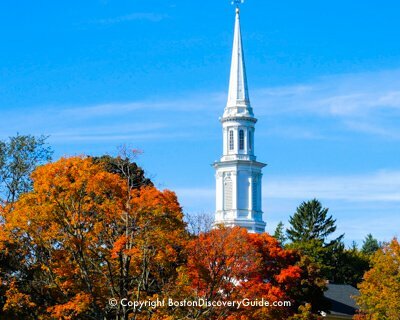 You can easily get to Salem from Boston for a day trip or weekend adventure. If you're visiting during October, check out all the Halloween festivities for - pun warning - a wicked good time. 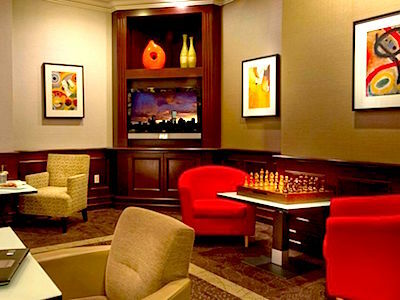 If you decide to stay over, you'll find plenty of attractive Salem hotels - mostly guaranteed to be ghost-free. Tours, witch museums, special events such as parades and séances, and plenty of costumes make the weeks leading up to Halloween a memorable experience in Salem. The annual Haunted Happenings Grand Parade kicks off the festivities for Halloween in Salem in early October with music, pageantry, and costumed students from Salem schools marching from Shetland Park to Salem Common. Come and watch - and be sure to wear your Halloween best. 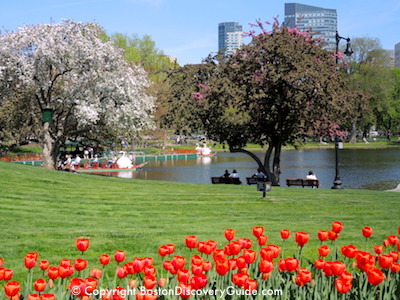 The Parade usually takes place on the first Thursday evening of the month - but check the Boston Event Calendar for October for the exact date and time. 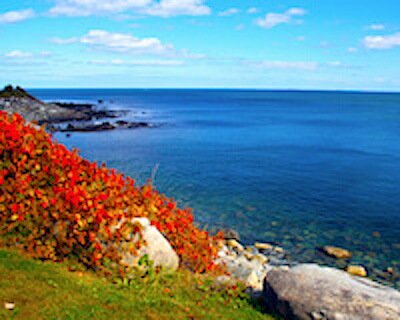 Spend the day soaking up witch trial history on this 7-hour Witch City Tour to Salem from Boston, which also includes a stop in beautiful coastal Marblehead. 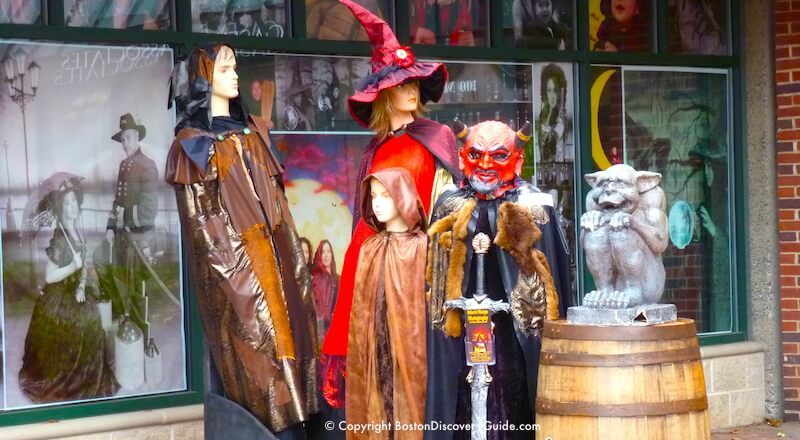 You can visit the Salem Witch Museum (or one of the other museums) and learn about witchcraft and the historical reasons behind the witch trials in Salem, Boston, and other areas. You'll also get to see Nathaniel's House of the Seven Gables, stop for lunch at Pickering Wharf, and explore more of Salem. 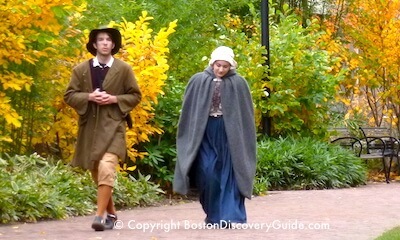 This seasonal tour takes place from June to October, and provides an easy, fascinating way to visit Salem. 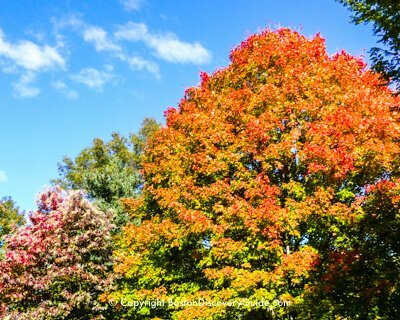 Throughout the month of October, numerous Halloween-related events such as pumpkin decorating, haunted tours, and even a pet costume contest take place. Many of these events are free while others charge admission fees. Some events for Halloween in Salem are expertly done, while you'll cringe at how cheesy others are - but hey, it's all in good fun! Witch museums abound in Salem. Once October arrives, they ramp up for Halloween with extra decorations, special effects, and blood-curdling screams. 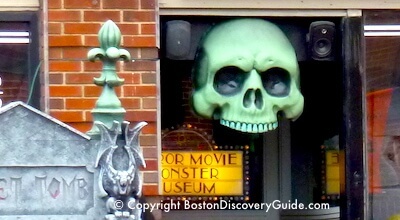 Here's a quick guide to several top witch museums and ghoulish attractions. As you'll quickly discover, most focus more on chills and thrills than historical facts - so go expecting to maybe learn a couple of things but mostly just have fun. 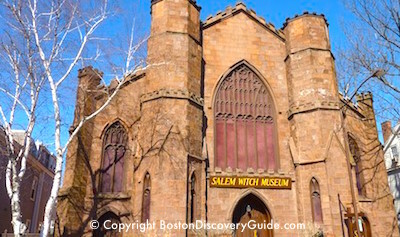 Located in an authentic old gothic church worthy of any horror movie, the Salem Witch Museum is the oldest of the witch museums and claims to be the most visited. You'll see animated mannequins reenact the sad drama leading up to the Salem witch trials and executions, plus exhibits featuring present-day ideas about witchcraft. Get ready for a guided tour of witchcraft through the centuries as you make your way through a "maze" of sets complete with mannequins, painted backdrops, and lights. The tour guides' narrative focuses on what's a witch, and what isn't, with lots of detail about present-day wiccans. 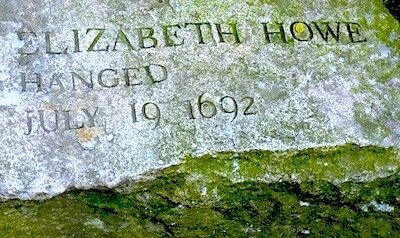 You'll also learn a bit about about Salem in 1692. Aside from the rather creepy fake spiders dangling in corners, Salem Witch Village normally focuses on delivering information rather than fright. 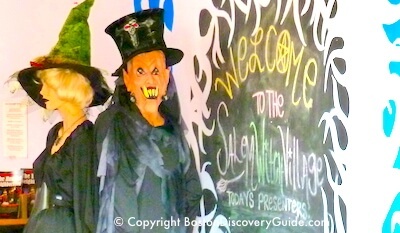 But on October weekends, the emphasis shifts to Halloween as Salem Witch Village becomes Haunted Witch Village where ghouls and goblins do their best to scare the visitors. 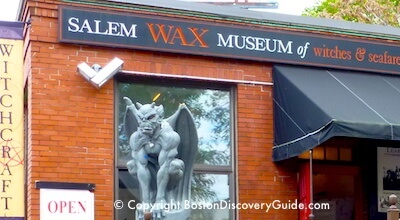 If you're a fan of wax museums, you'll probably enjoy the London-made figures in the Salem Wax Museum depicting local history from Salem's founding in 1626 through the witch hysteria of 1692. As a bonus, the museum also features other locals - Scarlet Letter author Nathaniel Hawthorne, bands of pirates, and more. Down in the dungeon - that is, the basement - you'll visit Frankenstein's Laboratory . . . if you can make your way through a maze, past grave robbers, and avoid the bats. When: October. Biggest revelry is on Halloween - October 31. Salem's obsession with the supernatural started back in 1692, when two local girls accused their neighbors of being witches and the town exploded with hysteria. Over the next 15 months, the Salem witchcraft trials left 20 people and 2 dogs - believed to possess "the evil eye" - dead, and hundreds more imprisoned. Although the persecution of witches died down as soon as it started and became regarded as shameful over the next couple of centuries, Salem has been promoting itself as "Witch City" for well over 100 years. Today, Salem is home to a Wiccan community - and the center of a festival throughout October celebrating its haunted past.